Just as you’ve finished eating your last leftover Thanksgiving turkey sandwich, Small Business Saturday rolls around, helping small businesses everywhere capture a bigger piece of the holiday spending pie. More than 95 million people spent money at small businesses during last year’s event, an eight percent increase over 2014, according to a survey by American Express and the National Federation of Independent Businesses (NFIB). In case you’re not familiar, American Express launched Small Business Saturday to promote small businesses six years ago. Today, 55% of American consumers are aware of this high-profile shopping day. Badges, banners, profile pics and cover photos can help promote your involvement in your marketing emails, on your website, and on your social media profiles. Pick up a free design tool, like Canva, to create your assets. If you need something fast, American Express offers free marketing materials that you can customize for your business on its site. Looking for more creative ideas? Check out Pinterest, which has hundreds of creative examples. With all of your digital assets created, you’ll want to point to a central location for all the info your customers need to spend with you. Design a Small Business Saturday landing page for your website. Include information like special promotions, photos of you and your team, a behind-the-scenes look at production, or highlight other small businesses you’re supporting. On Small Business Saturday, many retailers offer their clients a discount, a buy-one-get one free or for 50% off deal, a one-day special or a gift with purchase. If you’re a B2B, you may be more service-oriented. Consider offering a free hour of consulting, or 50% off the first month of service. B2Bs can also get in on the retail fun by partnering with local shops to offer your customer base something unique. For instance, buy your next 5 customers a cup of joe from the local coffee shop. You’ll want to share your Small Business Saturday promotion with prospects, but customers are an important marketing channel as well. Check your CRM to pull a list of customers who haven’t engaged with you in a while. Win them back with an exclusive email offer. Sometimes, all it takes to get back into the swing of regular purchases is a good reason to buy. Hold an in-store (or online) event. Small Business Saturday is a great opportunity to get facetime with your customers. Host a book signing with an important author in your industry. Hold a live demo of your software product. Throw a customer appreciation event or offer special discounts for 2017. Serve refreshments outside of your business to catch local shoppers. Special events can get your business engaged with your community, strengthen relationships with the prospects and customers you know, and extend your reach to a whole new audience. A busy shopping day like Small Business Saturday is a great time to add to your subscriber list. Include a signup sheet at your business location and consider offering a discount if they do. This is a perfect time of year to add to the roster of customers who receive any holiday promotions you are doing. Don’t limit your promotional efforts to your own place of business. Send a shout out to other businesses in your community that are celebrating alongside you on your social media pages. It’s a great way to build good will. And perhaps they will return the favor by spreading the good word about your business, too. Finally, Small Business Saturday is all about getting extra exposure for your small business. 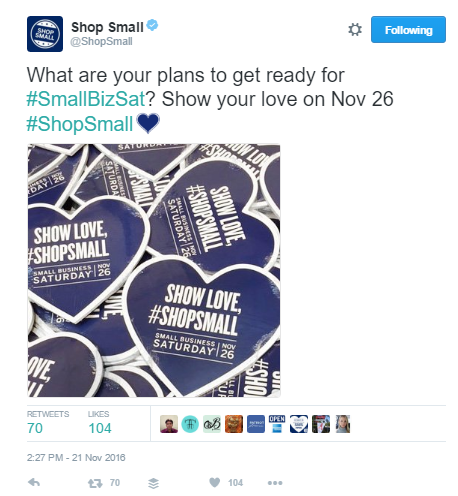 As you’re posting on social media, use hashtags like #shopsmall and #SmallBusinessSat to widen your audience and get more eyes on your brand. Small Business Saturday can be a big opportunity for your small or micro-business so make sure you have a plan in place to make the most of this once-a-year event.